It’s Apple Day today, October 21, according to British charity and lobby group Common Ground. Apple Day was initiated by Common Ground in 1990 and has been celebrated in each subsequent year by people organizing hundreds of local events. 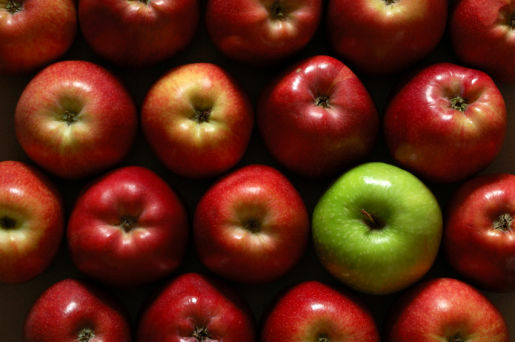 Our challenge today is for creatives to come up with marketing angles for Apple Day. Leave your comments below. Common Ground describe the day as a way of celebrating and demonstrating that variety and richness matter to a locality and that it is possible to effect change in your place. Common Ground has used the apple as a symbol of the physical, cultural and genetic diversity we should not let slip away. In linking particular apples with their place of origin, they hope that orchards will be recognized and conserved for their contribution to local distinctiveness, including the rich diversity of wild life they support. Apple Day events can be large or small, from apple games in a garden to large village fairs with cookery demonstrations, games, apple identification, juice and cider, gardening advice, games and of course many hundreds of apple varieties. What would you put on an interactive web site connecting local distinctiveness and apple variety? What would an Apple Day Facebook application look like? Clearly October works for Northern hemisphere orchards. Open days, ‘giveaway’ stands and so on. When would you run this in the Southern hemisphere? Who would you get to sponsor Apple Day? Apart from Apple?